You are looking at the NEW NASCAR DIECAST of the Brad Keselowski 2018 Miller Genuine Draft Darlington #2 Ford Fusion Penske Monster Energy Cup car.1 of 805.1/24 scale limited edition, exclusive by Lionel. You are looking at the NEW NASCAR DIECAST of the Brad Keselowski 2018 Miller Lite Patriotic #2 Ford Fusion Penske Monster Energy Cup car.1 of 529.1/24 scale limited edition, exclusive by Lionel. DRIVER:BRAD KESELOWSKI. FEATURES: CLEAR WINDOW CAR. HOOD OPENS ONLY. 2017 Brad Keselowski #2 Ford fusion patriotic, red white and blue. Comes from smoke free home. New inbox. Hood Opens, trunk does not. We are Ron's Racing Collectibles. We have specialized in NASCAR collectibles for 25 years! Even with our large showroom we are starting to run out of room. We have decided to part with lots of the thousands of 1:24 scale cars that we have accumulated over the years! 1:24th scale Brad Keselowski Raced Version. Miller Lite Kobalt 400 Las Vegas Win. 2014 - SOLD OUT Long Ago. Action Racing Collectable 2014. 2013 Brad Keselowski. Miller Lite Ford. Brad Keselowski. Miller Lite #2 / Las Vegas Raced Win. 2014 Ford Fusion. Shield Graphs are a specially formulated clear vinyl material that affixes over the windshield of your diecast giving the collector an instantly autographed car. 1:24th scale #2 Brad Keselowski FORD Fusion. 2014 Chase for the Cup - SOLD OUT Long Ago. Action Racing Collectable 2014. Depending on the light you display the car in. 2015 Brad Keselowski. 2 Miller Lite Retro. This is a great looking car with clear window and opening hood / trunk and vents. This is rare being only 1 of 1,273 ever produced! We are Ron's Racing Collectibles. We have specialized in NASCAR collectibles for 25 years! Brad Keselowski 2016 Lionel Collectibles #2 Wurth Ford Fusion 1/24 FREE SHIP! DUAL AUTOGRAPHED 2017 #29 CHASE BRISCOE COOPER STANDARD FORD F-150. AUTOGRAPHED BY BRAD KESELOWSKI AS WELL. ROOKIE STRIPES. BKR RACING. ONLY TAKEN OUT TO GET AUTOGRAPHS. I HAVE OVER 2000DIE CASTS, HATS, AND MISC I NEED TO GET RID OF ALONG WITH SAM BASS ARTWORK. 1 OF 1,042 PRODUCED WORLDWIDE. #2 MILER LITE. BRAD KESELOWSKI. RETRO FAN VOTE. 2015 FORD FUSION. Motorsports Authentic's 2015 Platinum Series is a 1/24 scale limited edition collectible that includes over 100 total parts. With a diecast body and chassis, this sleek replica's authenticity is evident. 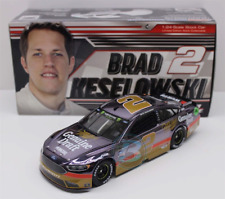 Brad Keselowski 2015 Lionel Collectibles #2 Wurth Ford Fusion 1/24 FREE SHIP! 2018 BRAD KESELOWSKI 1:24 NASCAR DIECAST. A nice addition to your Keselowski / NASCAR diecast collection. Only 481 Produced! Magic the Gathering. Sports Cards (All sports). U.S. & World Coins & Currency. You are looking at a nice dual Gold Autographed 2015 #2 Miller Lite 1/24th scale Diecast signed by Sprint Cup Champion Brad Keselowski and his crew chief Paul Wolfe. This diecast was signed by both men with a gold Sharpie. Don't miss out on your chance to own this awesome dual Autographed diecast! This beautiful Diecast will ship to the buyer after receiving a PayPal payment that is due within 7 days of purchase. Please be sure to check out my other rare Autographed diecasts on eBay. Thanks for looking! 2017 ACTION BRAD KESELOWSKI #2 WURTH 1/24 SCALE DIECAST COLLECTIBLE CAR. MUST HAVE FOR THE KESELOWSKI FAN! CAR#23 OF 505 MADE LOW DIN#. GREAT LOOKING CAR FOR ANY COLLECTION! THIS IS A BRAD KESELOWSKI 2018 MILLER LITE #2 1/24TH SCALE ACTION PERFORMANCE FORD FUSION. 1 OF 1,042 PRODUCED WORLDWIDE. BRAD KESELOWSKI. FONTANA WIN. 2015 FORD FUSION. Motorsports Authentic's 2015 Platinum Series is a 1/24 scale limited edition collectible that includes over 100 total parts. With a diecast body and chassis, this sleek replica's authenticity is evident. 1/24 2013 Action #2 Miller Lite / Penske Racing Ford Fusion as driven by Brad Keselowski. Gen 6 Model. Has the Action Collectibles DIN number printed on rear window deck to authenticate collectibility. Brad Keselowski. Darlington Win. 2018 1:24 #2 Miller Genuine Draft. NASCAR Diecast. Sports Cards (All sports). U.S. & World Coins & Currency. MUST HAVE FOR THE BRAD FAN! CAR#33 OF 72 MADE RARE . Brad Keselowski 2015 Lionel Collectibles #2 Wurth Color Chrome 1/24 FREE SHIP! 2017 ACTION BRAD KESELOWSKI #2 MILLER LITE 2X AUTOGRAPHED 1/24 SCALE DIECAST COLLECTIBLE CAR. CAR IS SIGNED BY BRAD AND ROGER PENSKE! CAR#338 OF 829 MADE THIS ONE IS SIGNED . GREAT LOOKING AUTOGRAPHED CAR FOR ANY COLLECTION! 2018 BRAD KESELOWSKI #2 DISCOUNT TIRE ELITE 1/24 SCALE Ford Fusion. NEW IN STOCK . 1/24 2017 Action #2 Miller Lite / Penske Racing Ford Fusion as driven by Brad Keselowski. Limited Numbered Edition 1 of 829 made worldwide! Has the Action Collectibles DIN number printed on rear window deck to authenticate collectibility. Brad Keselowski 2018 Autotrader Las Vegas Playoff Win Liquid Color 1:24 Preorder. Condition is New. Shipped with USPS Priority Mail. 1 of 60 produced.